I made this rolling toy using the plan from issue 66 of Woodworker’s Journal (Nov/Dec 87). The roller disks were made by laminating 1/2” thick oak and 7/16” thick spalted sycamore. Finished with several coats of Behlen gloss lacquer. I actually made three of these, so a couple of friend’s grandkids will be getting a surprise. Very cool Herb. The spalted sycamore steals the show! I see grandkids enjoying them…. I can also see cats & dogs chasing them around…. & you done good finding a purpose for the sycamore!!! I really like the spalted sycamore. I’ve got a piece of spalted oak that I held over the trash can the other day but I couldn’t do it. Figured there just be some use for it. Nice gifts. 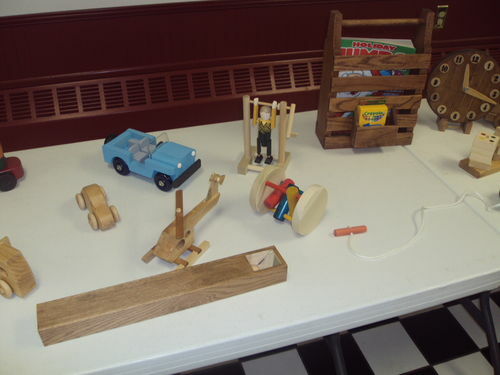 I made about 100 of them for our Mason Dixon Woodworkers Toy Workshop, about 5 years ago. I think and hope that they were a big hit for the kids/babies that received them. Yours look better than mine. We used three different colored dyes on the dowels. Nice toy, Herb. I recall playing with wood toys when I was real young. Now most of them are plastic. The spalted sycamore looks great. Thanks for the compliment. I like the dye job on yours, wish I’d done that on these. I really admire and appreciate all the work you and your group does making the toys for children each year. I hope to be able to get involved in something like that once I retire in a few more years. Love the wood. Adds character. Good job. I have made the same toy for my nieces and nephews, I used mineral oil as a finish so I did not have to worry about them ingesting any finish that could be toxic. What a fun looking non-electronic toy! I want to play with one. I like how you gave the end a “cap” of color. TechTeacher hopefully the finish will not be a problem although of course your concern is quite valid. James, I’m tempted to keep one myself. And I liked the idea of using the wild markings on the sycamore to dress things up a lot better than the painted green colored spiral design shown in the magazine article. I may have to make a couple of these for my daughter’s girls. That sycamore is really special! Flat sawn sycamore just never wants to behave.